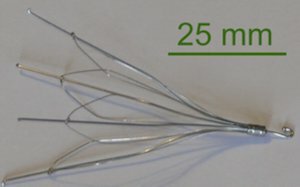 An inferior vena cava filter, or IVC filter, is a medical device designed to capture blood clots. The filter serves as an alternative to anticoagulant medications and blood thinners and requires surgery to be implanted in the body’s largest vein. The device resembles a spider in its design and can be placed permanently or retrieved after the risk of pulmonary embolism has subsided. While most people with IVC filters will never experience any adverse side effects from the device, there have been many cases of injury and even death due to complications with IVC filters. The FDA has confirmed cases of stroke, compromised breathing, pulmonary embolism, filter movement or migration, detachment of device parts/components, perforation or puncturing of the IVC through the artery, and filter fracture, among other complications. The FDA believes that many IVC filters that are intended for short-term placements are often left in long after the risk of pulmonary embolism is gone, leaving the patient at risk for adverse events and subsequent complications. If you or someone you know has experienced injury, a decline in health, or if you know someone who has died as a result of complications with an IVC filter, please contact us immediately so we can help you get the settlement you deserve. There are pending lawsuits against both C.R. Bard and Cook Medical. Speak to our personal injury attorneys in a free consultation today.